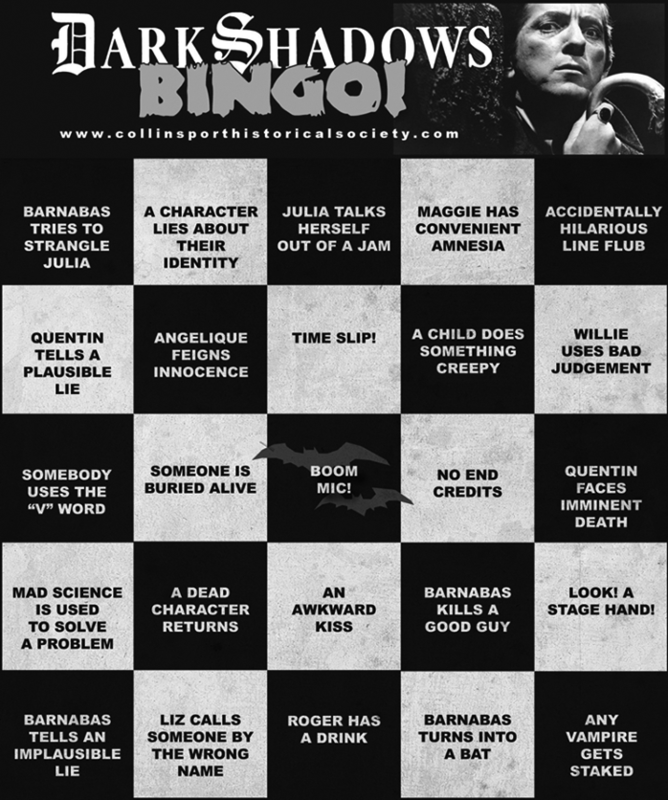 The Collinsport Historical Society: Dark Shadows Bingo! It's been a slow news week, mostly because reality has an aggravating way intruding. At the moment, I've got four podcast interviews sitting on my hard drive waiting to be released into the wild. The plan is to have a new episode available tomorrow night, but haven't decided yet what it will be. There's some fun stuff ahead, regardless. In the meantime, here's something I created for the Collinsport Historical Society's Facebook page. I wanted bingo tiles that had fun with the show's favorite tropes and eccentricities, but the trick was not creating something with a mocking tone. I hope I was successful. Love the Bingo game! Russ and I are just getting ready to sit down and watch another set of episodes. I guess we'll have to print out Bingo cards and see if this next week will be a winner!